Bali Driver from Bali A1 Driver team special provide for those of you who want a comfortable vehicle and friendly driver to accompany your trip during this tour. Sekumpul Waterfall, Ulundanu Temple, And Tanah Lot Temple Tour package is a tour for exploring the wonderful temple, the hidden beauty of Sekumpul waterfall and a wonderful vantage point to view a spectacular sunset at Tanah Lot Temple. The first place that we will visit is a temple which floats on the Lake Beratan (the second largest lake on the island). The temple’s name is Pura Ulundanu Beratan. This temple is famous for the beautiful natural surroundings with a view overlooking the mountains. Next is Sekumpul waterfall which has 7 hidden waterfalls in Sekumpul Village located in Sawan sub-district, Buleleng Regency of Bali. It’s a bautiful waterfall and there is a balinese village on the way. The final destination is Tanah Lot Temple. During the tour you will see beautiful rice field, a lake, historic temple monuments while passing through several local villages. The price is inclusive of private air conditioned vehicle, petrol, parking fee, mineral water and also English speaking driver. Ulun Danu Beratan Temple location is at Candikuning Village, Baturiti Subditrict, Tabanan Regency in Bali, Indonesia. Which is at the heart of the Bali Island, approximately 50 km to the north of Denpasar. It is on the main connecting road between Denpasar and Singaraja which is located on the northern coast. Lake Bratan is known as the Lake of the Holy Mountain due to the fertility of this area. It is 1200m above sea level and it has a cold tropical climate. Sekumpul waterfalls Singaraja Buleleng located is the northern part of the island. The green forest offers stunning natural scenery around the waterfall. There are at least seven waterfalls which are all separated. Jatiluwih is a village that has a vast expanse of rice fields with beautiful panoramic rice terraces. It is located in the district of Penebel, Tabanan Regency of Bali. This village is famous for the beauty of rice terraces that still use the traditional Balinese rice field irrigation system. It is located close to the mountains of Batukaru with a fairly cool air conditions. Pura Luhur Batukaru is a Hindu temple in Tabanan, Bali, Indonesia. The location is on the southern slope of Mount Batukaru which is Bali’s second-highest volcano. The temple is one of nine kayangan jagat (directional temples) meant to protect the people of Bali from evil spirits. Pura Luhur Batukaru was originally built in the 11th century and made for the ancestors of the kings of Tabanan. 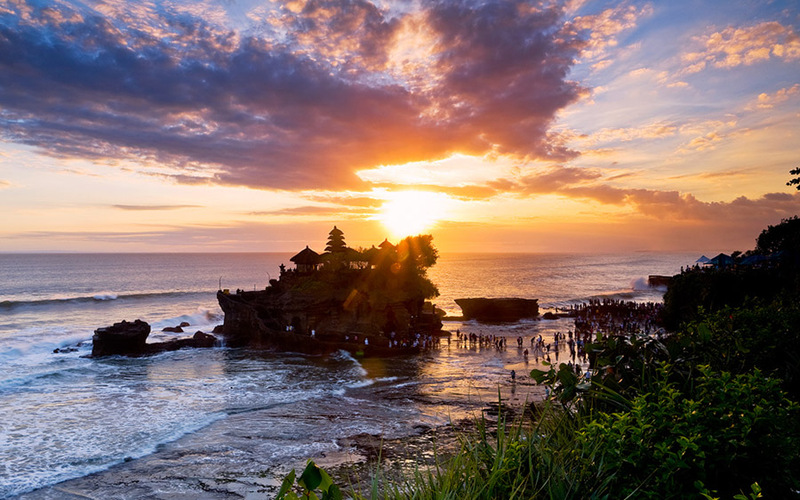 Tanah Lot Temple is located on the coast of the Beraban countryside, Kediri sub district in Tabanan Regency. 30km to the west of Denpasar and about 11km south of Tabanan city. The temple is built on a 3 acre size rock and is reachable in a few minute by walking, because it is just 20 meters from the shore at low tide. This temple is very famous among the tourist destination’s in Bali with spectacular view’s of the sunset.